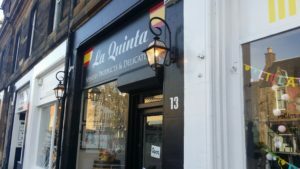 A couple of doors down from Bia Bistrot, La Quinta has been plying its trade as a Spanish deli for a while. More recently, it added a cafe to draw people to linger there a little longer once purchases had been made. I popped in to see what was what. The place is really smart with a beautifully corniced room added to with Spanish detailing and beautiful tiles. It has a lovely, relaxed feel to it. Their menu offers classic Spanish dishes with a strong Asturian regional influence, presumably reflecting where the owners are from. I opened with a classic gazpacho then followed with a slice of tortilla with chorizo, which was served with a little salad. 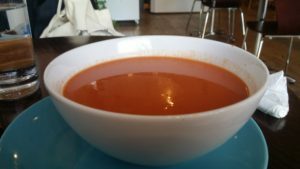 The gazpacho was a huge bowl. The smooth, chilled soup had lovely complexity of flavour from the tomatoes, peppers, cucumber and onion. I enjoyed it. 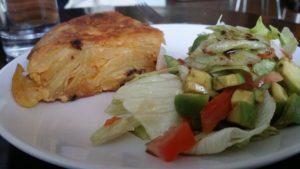 The tortilla was of similarly pleasing quality with good chunks of lightly sweet chorizo in the substantial egg and potato dish. It was another really good eat. So overall, I was glad to finally visit La Quinta. It’s a rather charming little deli selling good quality Spanish ingredients and making pleasing regional dishes. Next time you fancy something in this style make sure to visit.